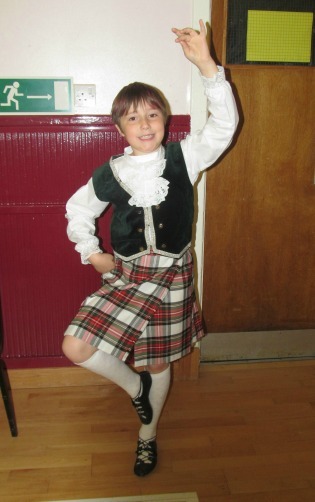 M had her Highland Dancing exam yesterday. She was very outwardly calm about it, practising regularly and going to all her extra classes (once a week after school) and seeming quietly confident. However, on Friday evening she had her melatonin at the usual time for a weekend which means that she should have been fast asleep by 8.30. Hah! I was out collecting something so I got home about 9. She was suddenly wide awake and downstairs “E forgot to brush my teeth.” Her big sister had indeed forgotten, so a quick brush later and she was tucked back up. The next hour and a half was hard work. I had a little Jack-in-the-box, not a sleepy daughter. Her final assault on my emotions was a pathetic wail that we hadn’t fed her any tea and her tummy was rumbling. (I would like to point out for any worried readers that of course we had fed her.) I sent her back downstairs for a jam sandwich and a drink, and called down to hubby to stick a second melatonin in the sandwich. We’ve been strongly resisting upping her dosage even though the paediatrician said we could, as usually she will settle. This time it was needed, and thankfully she finally dropped off about 10.45. The next worry was would she wake in time. Being woken is a sure-fire way to turn her mood into cranky straight away, so it was with huge relief that she was awake and cheerful in plenty of time in the morning. I deliberately didn’t get to the hall too much in advance. M has short hair so nothing needed to be done except for changing into her dancing outfit and having her photo taken (I do this every year). She was quite buzzed and hyper, whizzing around the room and chatting to everyone. I managed to calm her down by giving her my tablet to play some games on. And then she went through for the exam. We stuck rigidly to our usual post-dancing routine of snack at the cafe, wander around the charity shops and then a quick top-up shop in the supermarket before heading home. B had had a lovely morning out in the garden helping L with her guinea pigs and bouncing on the trampoline. He was full of sunshine and good spirits. Unfortunately for him, he had also borrowed some of M’s dinosaurs to play with. She went nuts at him, really over the top, and hit him hard before I was able to intervene. I know she was exhausted from the late night and change in routine but violence to other people is a hard limit in our house, I comforted B while L raced upstairs for the weighted blanket. We parked M on the sofa in front of a dvd and told her firmly not to move unless she needed to pee. Thankfully, it worked. the quiet time and the deep pressure from her blanket soothed all the upset away and gave her time to “restore factory settings” as I tend to think of it. I guess the nerves about the exam, the late night and the change in routine from lesson to exam was enough to tip her over the edge. Poor B was just the trigger for her explosion. I think if it hadn’t have been the dinosaurs it would have been something equally small – and maybe I would never have been able to avoid it. When she is older I am hoping she will know to take herself somewhere quiet for a while in order to decompress and manage her anxieties before they hit meltdown, but I am grateful that I was able to contain most of it and keep her and everyone else safe. We ended the day in a much nicer way, M and B friends again. 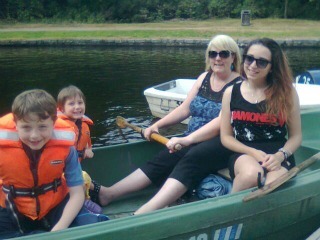 I took them to the local shop to choose an ice lolly then we headed to the park. They had a wonderful hour playing in both parks, and in one they met some friends who were delighted to see them. 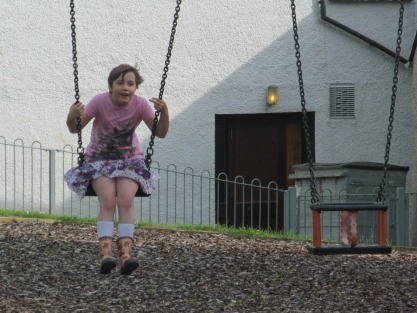 M spent most of her time on the swings – she adores the motion and I think they calm her. I can understand this as my place of refuge as a child was my swing in our garden. I could spend literally hours swinging. The evening routine went without a hitch; cuddles and melatonin and being very tired from so much exercise was enough to send M to sleep before 8.30 and the “normal” was restored. 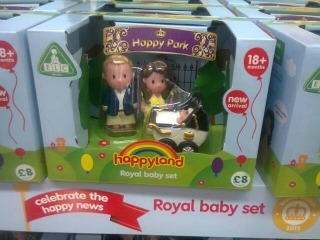 I do need to learn to pre-empt the meltdowns though – perhaps I should have had her blanket and dvd waiting for her. As a so-called “neuro-typical” myself it is very hard if not impossible to think ahead about what might be ahead that upsets M to the point she can’t handle her emotions. Every time she explodes it gives me an insight into how not to handle it next time. I know as she matured she will learn to self-regulate but until then I will keep on trying to keep the scales balanced. M was happy this morning as she knew I would be collecting her from school early – just before lunch break in fact – for an appointment with the paediatrician. Her whole mood was buoyant before school which made a very pleasant change. I have hired someone to help hack a path through the worst parts of the garden before the house disappears under the invading foliage and he turned up and set to work with zeal well before 10 o’clock. As I know his parents and about ten other mutual friends I felt more than happy to leave him when I had to go out, and trust that he will be honest about how long he was working for. M’s appointment was a routine catch-up, and also a request for more melatonin. For some bizarre reason it is up to the individual surgeries as to whether they will prescribe it or not. We have two practices that share one building; Sod’s Law dictates that I am with the practice that won’t, so it’s a convoluted system of the paediatrician putting in the request to the main hospital, then to the hospital pharmacy, and then by NHS van to the health centre. This can take up to a fortnight. Bearing in mind the local chemist could fill any melatonin prescription within 48 hours this is rather frustrating. And a very good reason to know other parents whose kids also use melatonin for the inevitable time that you run out! Anyway, we had time to grab a quick bowl of soup at a wee cafe, then as a friend had kindly agreed to collect B from school for me, I was able to take M into Inverness for her monthly special needs drama class. It’s run at the theatre and is usually a very small group of children, which is manageable for her. The theme this term has been Dreams, and this month was billed as Dream Crafts. M was keen to go – she does love a bit of cutting and sticking. I am also keen for her to go! I get one whole hour to sit with other mums and drink Eden Court’s finest cappuccino whilst we chat about anything and nothing. It’s a win win situation. The gods of traffic were on our side tonight and we drove home in good time. B had been dropped back at home after Big Sis was home from high school and was in a calm happy mood too. Tea and the pyjama routine were done with minimal fuss, although the two little ‘uns were somewhat on the hyper side of cheerful for some reason and needed some full strength sofa snuggles before getting tucked up. It will be interesting to note the anxiety levels of M tomorrow when she knows she has a full day of school ahead of her. Maybe the afternoon session really is too much for her to handle? But I am not yet sure I want to commit to a split school/home placement. Is it psychological or is there a sensory issue? All questions I am still trying to work out. 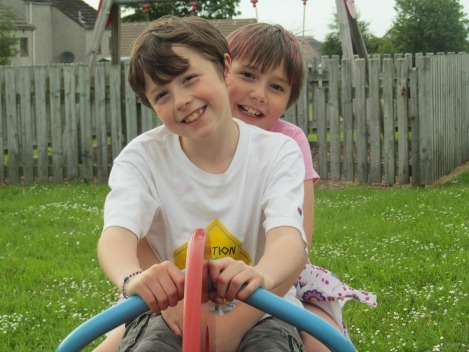 Autism – often challenging, never dull. Yesterday was the “dreaded day” when M got her 48 hour heart monitor. The purpose is to try and discover what is causing M’s wee heart to suddenly race. It might possibly be the case that she has a reaction to melatonin, but her regular paediatrician and the hospital paediatrician both think it’s more likely to be anxiety-based. Although it must be distressing to be so anxious that your heart speeds up and pounds I find myself hoping that this might be the answer. A melatonin related cause would be disastrous for M’s sleep issues, and a physical defect in her heart, well let’s not go there for the moment. As it turned out, she was very calm, almost subdued, while it was being fitted – I had been worried she might take one look at all the wires and bolt – so after ascertaining that trampolines were not out of bounds, and as long as she kept herself dry e.g. no baths or visits to the beach or swimming pool, she was free to continue with life as normal, a happier wee girl left the cardiology clinic. so pocket money was handed over with a big smile. Due to M’s general high anxiety in towns and shopping centres I had made her a fairly detailed visual chart for the day. However I was delighted that when I realised we had time and suggested a trip to the big park that she was more than happy to go. The park was very crowded and contrary to my explicit instructions M kept running off, towards the parts that had fewer children in, so we decided to hire a boat to take her away from the temptation to run. It was surprisingly hard work, but a lot of fun. Now we just have to get through until tomorrow lunch-time and then the monitor gets sent back to the hospital to be analysed. Let’s hope we get good news! We didn’t have a bad weekend, we just didn’t have a good one. From the moment M exploded out the school doors on Friday afternoon I had a “feeling” As it was sunny I let her race around the school playing field with her brother and some of the other children for half an hour (we are allowed to use the pitch out of school hours which is very handy as there is a lovely bench right in the strongest sunlight) and then we headed home for some quiet time. M could not settle to anything. She was more of my shadow than she normally is, to the point that it was unsettling me too. She wasn’t spoiling for a fight, or particularly jumpy but I could tell she was “not right.” It almost seemed as though any second she was likely to burst into tears. So I stuck her in the bath for an hour – all by herself – and it helped a bit. Although I realised when I told her to choose as many toys as she wanted and she just looked at me helplessly and said “but how many Mumma?” that I was right to be concerned. The entire weekend continued much along the same lines. Uber-clingy, on the verge of meltdown but luckily never getting there, and totally unsettled. I gave out as many super-hugs as I could, but I think it was a relief to both of us when the evening came and the melatonin kicked in. 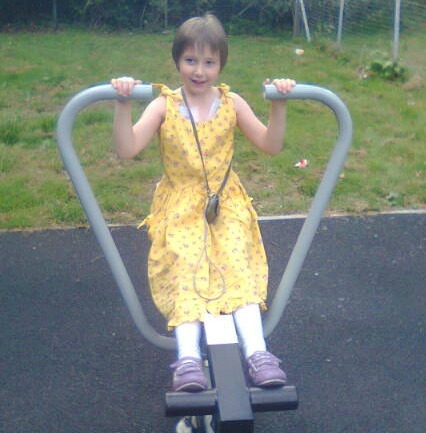 As dd2 and I had finished the trampoline it was lovely to be able to send M outside for some welcome bouncing. She must get one heck of a feedback from bouncing, but I love it as it’s in the fresh air and it’s healthy. Hubby and I discussed the issue and came to the same conclusion. We think that M has been suffering from a sensory hangover. She has expended too much effort in spending more time in the classroom, interacting with her peers, and socialising at breaks, without having enough of the compensating quiet times. We did think that maybe her eagerness to join in the group work for more than our suggested 10 – 15 minutes was too much too soon but it is very hard to say “no” when M was clearly happy to be more involved. I wrote in her home-school diary and had a word with her PSA and the head teacher this afternoon. They are happy to be guided by me as to what we cut back on, so we decided that I would speak to M and try to explain, and then any group activities that have been started in the last week would continue but with a strict time limit of 15 minutes; M will then return to her separate desk outside the classroom. Maybe the short walk and the change of seating will be enough to reset her system that little bit it seems to need. The idea is that I will update the staff again next Monday and we’ll see how this week has gone. It’s such a fine line, and without M’s input it’s educated guesswork, but she is only six. She has no idea how things unsettle her, just that sometimes they do. It just goes to show after my positive posts last week just how fine the line is between getting it right and not quite managing, but hopefully we can tweak M’s situation to make this week a great one including the weekend. Yesterday morning I purchased a teeny little bottle of something that other parents on an autism chat forum had told me could be helpful in getting M to sleep, seeing as she is really suffering from lack of melatonin. She’s suffering? So are we! Anyway, this tiny bottle says it’s suitable for the whole family, and I quote, “has been used to help switch off the mind from unwanted repetitive thoughts”. Hmm, I thought, they’ve met M then! I must admit I wasn’t convinced. I decided to try it for taste, and put one drop onto my tongue. It was quite pleasant, slightly sweet but not really, and most importantly no bitter after-taste. After the evening pyjama and teeth-brushing routine I was rather surprised to see that M was so keen to try it – maybe I shouldn’t have been as the poor girl really hates being in bed and not being able to switch off (we have had years of tears and tantrums to testify to this) so I put 4 drops on her tongue and hoped she didn’t start spitting it out or screaming. No, all good. In the pre-melatonin days I was very used to random bumps, chattering, books hitting the floor and small feet pattering about as M tried in vain to do anything but lie down and wait for sleep, it was as though her body just could not stay still. So I was expecting the noises. None came. Like, none at all. In the end, when I could bear it no longer, I crept upstairs at 9.20 and she was fast asleep! I think she was in fact sound asleep well before then, maybe even by 8.45, but I was too scared of disturbing her. Although she was a bit restless about midnight she stayed asleep till morning. What a result! Now of course evening is approaching and I am praying like mad that last night was not a one-off. The product I bought was Bach Rescue Night. I would just like to point out that I have not been paid for writing about this product, or sponsored or anything like that. Poor M is on her third day of no melatonin. We think she might have an adverse reaction to it, as she has been telling me that her heart has been “going very fast Mummy”. She has been to the GP who said not to worry (I’m sorry this is my child and you’re telling me not to worry! ), and she is due to have an ECG and an appointment with the paediatrician asap. But of course, it could be the melatonin, or there is enough evidence from the internet searches I have to done to suggest that, so as any sane parent would do I have removed it from her bedtime routine. Friday wasn’t too bad as she had been suffering with a sickness bug and fell asleep propped up against me on the sofa. Last night was a different story. it was 10.20 before she finally dropped off. Sadly this didn’t make her sleep any longer this morning, and tomorrow is a school day so I am dreading how hyper and sleepy she might be. It doesn’t help that we have had half an hour (so far) of yelling and telling me she won’t go to bed as she won’t be able to sleep. Staying calm whilst dragging a 6 year old up the stairs is no easy matter. I have had some suggestions from other parents of autistic spectrum children about alternative sleep remedies to try, so tomorrow I will be ringing the local chemist to see what they stock, and hoping that one of these remedies will work. Until then, I may suffer from some grumpiness!